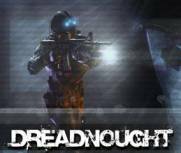 Torc Interactive, the North West of Ireland games developer and middleware company, recently released a demo of their first person shooter game, ‘Dreadnought’ . It was made for AMD to highlight their latest processors, the AMD64 line. 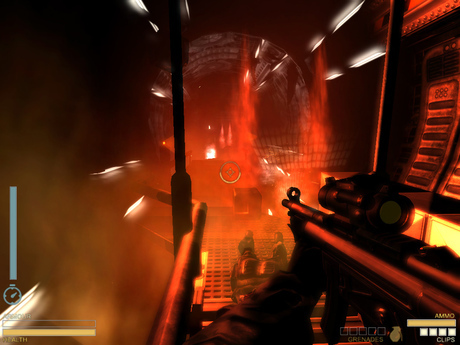 The game is based on Torc’s ‘Instinct Engine’. According to AMD, when in ‘64-bit enhanced mode’ Dreadnought will highlight improvements with games running on 64-bit processors - such as, improved graphics detail and quality, bullet holes staying on walls and not fading over time, and other effects. As previously revealed by Games Toaster, the game is set on a nuclear warship in stormy waters. The demo starts as you enter the ship. The ship, a nuclear missile cruiser named the Admiral Ushakov, was last seen in the Barents Sea four years ago, and was apparently believed lost at sea. When it reappeared near Iceland, it is then thought to be in terrorist hands. The terrorist are using the ship for some kind of ‘research’, and the player-character is (you guessed it) a ‘US Special Forces operative’, sent in to “steal or destroy”. The demo and screen shots can be downloaded here. Torc Interactive, the Donegal/Derry based games developer and middleware company, is set for a busy year. Expecting to release a mini-game with the computer processor manufacture AMD early this year, starting work on a full game of their own later in the year, and on the middleware side of things, fully reveal their ‘Instinct’ game engine at the Game Developer Conference (GDC). The showing of their tech demo at last year’s GDC lead to the developer being noticed, and then to the making of the first person mini-game with AMD, named ‘Dreadnought’. It is set on nuclear warship out at on a stormy sea; Torc proposes to include “a unique sense of realism and depth”. Torc Interactive, the Co Donegal based games developer, are currently working on a PC and Xbox game engine, and a number of game ideas. Torc begin work on the engine September last year with the hope to have it completed for GDC 2004 in March. They also plan to have a playable technical demo nearing the end of November. “As you can see the fully unified, per pixel lighting is looking a treat, and take our word for it, running in-game like a dream. We are currently having fun throwing objects off walls and dead bodies around the levels!” states their website. “Our main focus right now is in finding a publisher. We've a few game concepts at various stages of development that we're looking to pitch around November. Early responses have been very encouraging, and we're in the process of forming our strategy to leverage the best deal for us”, Dermot Gallagher of Torc said to GameDevelopers.ie.